Director Michael Storm Revives Mamet’s Monsters: Vampires Live! 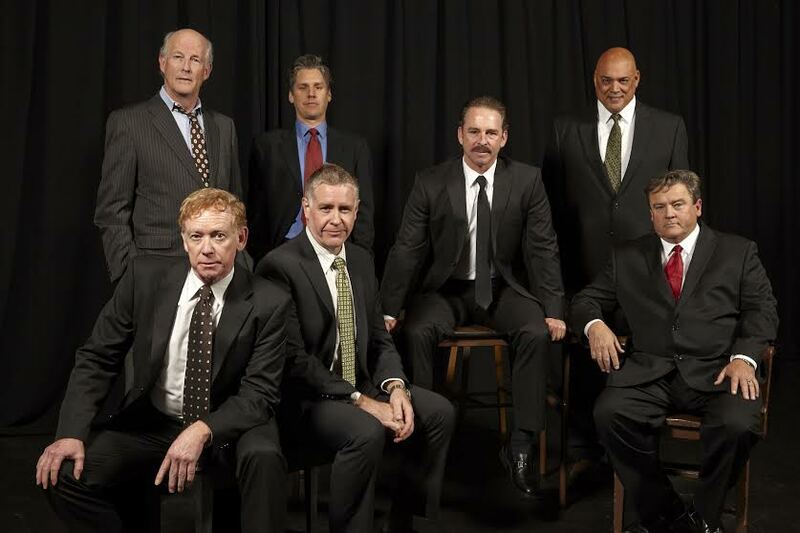 The cast of TheatreFirst’s revival of David Mamet’s masterpiece, “Glengarry Glen Ross.” Photo Credit: TheatreFirst. A brilliant direction of a masterpiece play, re-imagined for Our Time in Our Town — don’t miss it. There’s no rapid fire Mamet line deliveries here — Michael Storm has re-invented the pace and the deliveries, magisterially teasing out the nuances and the comedy. We feel and become the struggling, trapped fish in the swampy Florida land deal. We laugh at the faux-Scottish names for real-estate scams. In a re-invented role, Storm plays a version of Ricky Roma that will set your teeth on edge: he’s like a cobra, you cannot take your eyes off him — and still we laugh and love him at the same time! He is the world’s best BSer! How does he do that? Michael Storm’s Ricky Roma is the Church, and the actor/director knows that the Church, corrupt as it is, still has a heart, even while he’s playing an Italian confidence man in 80s Boom Chicago. Roma ruminates, while Shelly “The Machine” Levene, the hapless Old Testament salesman, played by Warren David Keith, pompously pronounces prophetic and zealous revenge, “an eye for an eye.” And the Office Manager, John Williamson (Tim Redmond), he’s the New Man, who listens, waits, and pounces—the Protestant “Ethic,” running the show for the bosses. Redmond plays perfect Corporate Tool, working for the Koch Brothers, pitting one salesman against the other, coldly, humorously, callously. Catholic, Jewish, Protestant—all present and sucking the blood. Each and every actor is spot on—drawing out the language and the torture and the ridiculousness of their creations. Even the Little Fish are glorious in their victimhood—James Lingk (Chris Hayes), following his wife’s orders; George Aaranow (Michael Torres) ordered around by the masterful and methodical Dave Moss (Kevin Karrick); and the always triumphant Ricky Roma (Storm) thundering down on the vanquished Levene (Keith). Williamson (Redmond) and Baylen (Robert Lundy-Paine) stand for authority in the shell game Ponzi scheme, and they are scary-real vampires, too. When TheatreFIRST decided to bring back the 1986 Pulitzer Prize-Winning play, “Glengarry Glen Ross” by David Mamet, they must have been thinking that this play about real estate sharks certainly applies to our 21st Century America. Post-Crash, Post- Recesh, Post-Dot-Com Bust, the sharks are swimming again—did they ever stop in Oakland, Berkeley, San Francisco? This production asks us: When will the Bubbles Burst Again? And who always gets hurt? But then the stakes go up and up: here comes Dave Moss (Kevin Karrick) and George Aaranow (Michael Torres) at the same blood red restaurant table, and they are also at each other’s throats—two fellow real estate salesmen, co-workers from Mitch & Murray’s corrupt sales shop. Here we have the essence of capitalist skullduggery—the road downward from Miller’s “Death of Salesman.” The working conditions and the outright lies have rotted and spread, decade by decade, corrupt sale by sale. When will it end? The sharks are eating each other, right in front of our eyes—and it’s a Comedy, folks. Worthy of Greek comedy and Greek tragedy—exposing our Reagan/Bush Business Culture of lying and faking and flim-flamming right in little Live Oak Park Theatre, in lovely North Berkeley. Each actor is at the top of his game. Every one. These are all pro’s, and they are here to work for us. Watch out for those fangs. Each element in the perfectly paced show unfolds so that we can savor it as it comes—we groan, we howl, we guffaw. We are with them up there in the real estate speculations that have come to dominate dinner tables in Berkeley, OakTown, and S.F., tonight. The ghouls have come to dinner with us in the 21st Century—and we better take careful note of who is who. TheatreFIRST lets us discover them for ourselves in the finest staging of “Glengarry” seen in many a year. Storm will take you by the throat. See real-life real-estate Vampires, hungrier and more blood-curdling than any Hunger Games! A play for the whole family. “Glengarry Glen Ross” plays at Live Oak Theatre, through May 24. For further information, click here. “Glengarry Glen Ross” by David Mamet, produced by TheatreFirst & Bonnie Stiles. Director: Michael Storm. Set Designer: Martin Flynn. Lighting Designer: Hamilton Guillen. Costume Designer: Kristyn Nolasco. Sound Designer: Ryan Short. Shelly Levene: Warren David Keith. John Williamson: Timothy Redmond. Dave Moss: Kevin Karrick. George Aaronow: Michael Torres. James Lingk: Chris Hayes. Ricky Roma: Michael Storm. Baylen: Robert Lundy-Paine. Posted in Reviews.Tagged Barry David Horwitz, Boinnie Stiles, Charles Kruger, Chris Hayes, David Mamet, Glengarry Glen Ross, Hamilton Guillén, Kevin Karrick, Kristyn Nolasco, Martin Flynn, Michael Storm, Michael Torres, Robert Lundy-Paine, Ryan Short, San Francisco Theatre Reviews, TheatreFIRST, theatrestorm, Timothy Redmond, Warren David Keith.